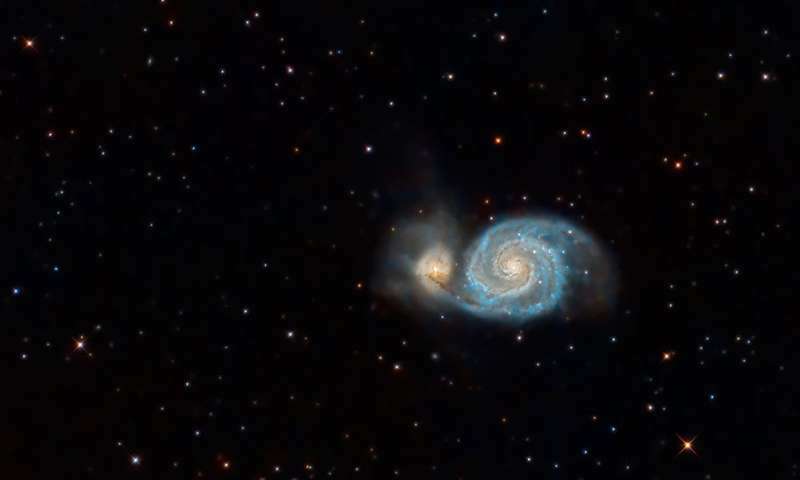 Astronomers have been keenly peering into M51, or the Whirlpool Galaxy, since the 1800s, its signature spiral structure informing the earliest debates over the nature of galaxies and the Cosmos at large. But no one—not with the naked eye or with increasingly powerful modern telescopes—has ever seen what Case Western Reserve University astronomers first observed using a refurbished 75-year-old telescope in the mountains of southwest Arizona. Mihos and a trio of collaborators— led by then-graduate student Aaron Watkins, and including Case Western Reserve Observatory Manager Paul Harding and University of Wisconsin astronomer Matthew Bershady—wrote about the discovery this month in the journal The Astrophysical Journal Letters. In part, because they looked in the right spot with the right equipment—and then enlisted the help of a colleague to confirm it with additional data. "Finding stars is relatively straightforward, but gas doesn't shine at all wavelengths," Mihos said. "That's one of several reasons why no one had ever seen this before— earlier studies using these kind of hydrogen filters to look for ionized gas couldn't detect emission this faint and over such a wide area around the Whirlpool to see what Aaron found. But there was still one thing to double check: "Our worry was really what I would call 'the dirty windshield analogy'- what if we were actually seeing a diffuse cloud of gas right in front of us in our galaxy and it wasn't really part of M51?" Mihos said. "We could figure that out if we know how fast it was moving—does it move slow like clouds in the Milky Way, or much faster like those in M51?" The discovery's role in more clearly understanding how galaxies eject and "recycle" their gas and stars," Mihos said, will be determined in the coming years as more researchers dig into information that had been there all along—even if unseen until now.